Saturday, April 30th, the boys’ and girls’ track teams competed at the inaugural EPIC track and field championship meet. The girls finished a very respectable 2nd place to Cary Christian. As conference runners-up, they bested reputable foes in St. David’s, Trinity, and Grace of Raleigh. 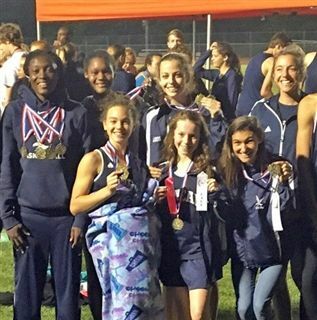 The highest-scoring athletes for the girls were Toyin Koleoso and Madison Fox. Combined, they brought home seven gold medals. They were both on the winning 4x100 meter and 4x400 meter relays. Toyin’s 16.89 in the 100 hurdles was a personal best. Madison Fox won long jump and finished fourth in the 100 hurdles, very narrowly missing third place. Other major contributors were Catherine Huntley with a pair of second-place finishes in the throwing events, Molly Kuzma with a win in the 3200, runner-up in the 1600, and third in the 800. The women’s 4x100 team, Megan Bloom, Lauren Dailey, Madison Fox, and Toyin Koleoso ran a 54.75 for the third fastest in O’Neal’s recent history. Zsanett Darabont was third in the high jump and triple jump. On the boys’ side O’Neal saw solid performances in third-place finishes in the 4x100 and 4x200 relays. Josh Russell finished a respectable 4th place in the 3200. The boys’ 4x800 enjoyed a second-place finish for a season record 8:58.19. Chris Vamvakias had a breakthrough day in the discus for a 6th place finish. Wesley Pollard scored in the 100 hurdles in 6th place. O’Neal Varsity Track and Field is getting ready for the NCISAA state championship scheduled for May 20th and 21st at North Raleigh Christian Academy.